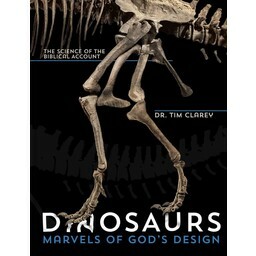 Our T-Rex is king - inside and out! This chunky, double-sided Tyrannosaurus puzzle has the dino's bone structure on one side and friendly features on the other side. Our T-Rex is king - inside and out! 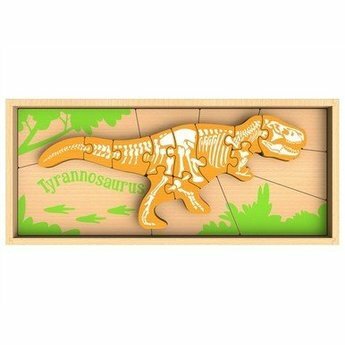 This chunky, double-sided Tyrannosaurus puzzle has the dino's bone structure on one side and friendly features on the other side. 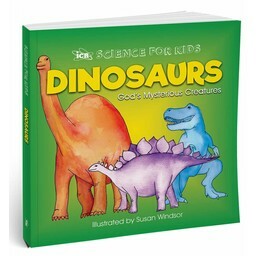 More puzzle pieces set the scene, teach the dinosaur's name and hold the dino in place within the included storage/display box. 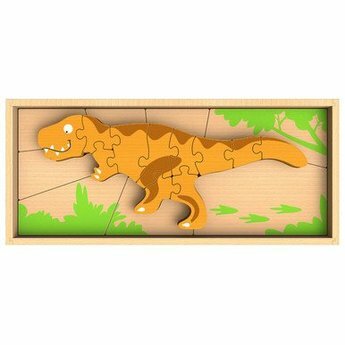 Made from eco-friendly rubber wood with child-safe stains, this 19-piece puzzle develops fine motor and problem-solving skills while pleasing little dinosaur devotees. Total Shipping Weight: 1 lb. 8 oz.